I've been finding myself more and more busy these days (who isn't, really). It seems like everything is wanting my attention--kids, family, sewing, blogging, teaching, church activities. I needed to create some sort of organizer so that I wouldn't fall behind or forget about my blogging commitments and sewing projects. I also homeschool my kids. My time in the day to work on sewing and blogging projects is limited. Our day usually consists of doing school in the morning and early afternoon. After that the kids are free to follow their own interests, while I'm busy working. This has been a great routine for us to get into. I used to work on these types of projects after the kids were in bed, but since they are growing up and no longer go to bed at 7:00, I needed to be a bit creative so that I could dedicate specific time each day to working on these projects. 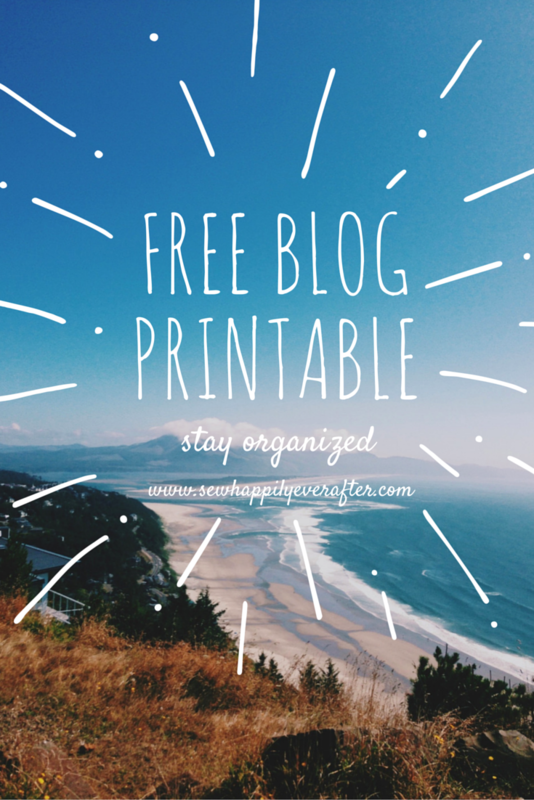 I created this free printable to keep me organized with my blogging and sewing projects. It includes space to write down the current projects that I'm working on and when they are due as well as when the post will be live. I also included a box to check off when the post is written and when it is published. This way I wouldn't forget about any upcoming projects. I also write on the schedule ideas that I have for new projects or goals that I want to accomplish for the month. This way when I'm feeling bored and not sure what to work on, I can glance at my ideas and get to work on one of those. I thought I would share this printable with you, to keep you organized. It's really rather simple, but at least you won't need to create one from scratch.